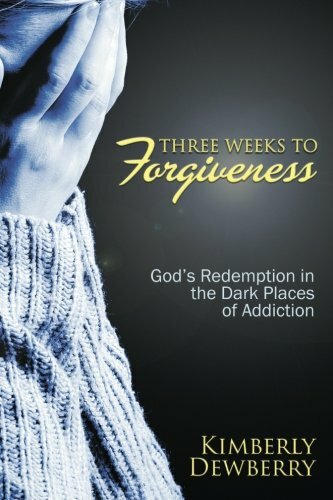 “Three Weeks to Forgiveness: God's Redemption in the Dark Places of Addiction” by Kimberly Dewberry is her compelling journey to forgiveness and healing. Kimberly is the child of an addict. While she was growing up, she got to see both the good and the bad sides of her father. At times he was a hardworking man and a loving husband. Then there were other times where he would leave the house and disappear. Frequent let downs by his addiction caused her to develop negative feelings about herself including shame, hurt and unworthiness. This had a huge impact on Kim’s personal relationships. Her feelings of unworthiness kept her from making the best choices regarding some of the men in her life. These feelings also caused her to run away from her first love. Years later, they were able to reunite and are still married today. During her darkest hours, Kimberly found herself stepping away from her faith, even though this is when she needed it most. When Kimberly’s father re-entered her life he was terminally ill with cancer. She was able to bring him to her home for the last three weeks of his life. Her mother was also able to reunite with him at this time. Kimberly’s return to her faith helped her get through these tough times. This is a powerful story. Readers will witness clearly how families are impacted by addiction. Kimberly shows us the father that she adored and the man who succumbed to his addictions. The love between her mother and father was heart wrenching because even after years of being separated, it was obvious that they still loved each other. The healing power of Kimberly’s faith shines through her journey as well. In “Three Weeks to Forgiveness: God's Redemption in the Dark Places of Addiction” Kimberly Dewberry shares her life story with candor. She includes both the good times and the bad. Having reconnected with her faith, she includes prayers and meaningful bible quotes. She is also able to end the cycle of familial dependence. Kimberly’s faith based journey to healing with her father and her family, will help inspire others who are trying to find a way to recover aspects of themselves that were lost due to dealing with addiction.